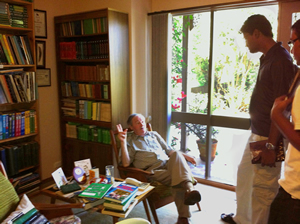 Roger Page is Australia’s only full-time cricket bookseller. Born in England he moved to Tasmania with his family at the age of twelve. Though only an average cricketer at school he always had a passion for the game. By the age of nineteen he had already scored in a first class cricket match. Upon finishing school he went to the University of Tasmania, graduating with an arts degree. At twenty two he had written ‘A History of Tasmanian Cricket’. He taught English and History at a number of Tasmanian High Schools. He wrote on the game as well as being the Australian agent for the English cricket eccentric Rowland Bowen, the editor and publisher of ‘The Cricket Quarterly’. Always interested in cricket books he ventured into cricket book selling in late 1969 as a means of increasing his collection. He soon realised that to make the business viable he needed to move to the mainland. In 1972 he married Hilda and together they set up home and business in the outer Melbourne suburb of Macleod. It was here that the business grew and developed. Roger Page was appointed as Australian agent for a number of overseas journals, annuals and magazines. He also became the agent for book publishers and the supplier of ‘hard to get’ cricket books. Collectors, writers and researchers sought him out on cricket literary matters. After his arrival in Melbourne he became associated with the Fitzroy Cricket Club as their first team scorer, a position he still holds today. Roger Page is a life member of the club.